I have a lot of memories related to this dish, since when - I was about 5 year old - I was helping my grandma to seal them with a fork. Casunziei are typical of my hometown Cortina d’Ampezzo, where every woman has her own recipe. There is also a verdi or green version, where the filling is made with some special wild greens, even if nowadays many use chard or even spinach - ahhhh what a shame! - instead. I like them both, but if I have to choose, I'll take the ones with the beets. Yesterday I felt a little homesick, and since the weather was cold and rainy, I thought it would be the perfect afternoon to spend in the kitchen. I dedicated them to my beloved Cortina. Don't forget to give them a try, if you happen to be there. For the filling, cook beets and potatoes separately. You can either boil them or - better yet - roast them in the oven, wrapping them individually in foil (this way they'll absorb less water and the flavour will be more intense). Peel them and puree them using a potato masher and trying to eliminate as much water as possible. Mix the two, calculating a third of the weight of potatoes and two thirds of beets. Heat a little oliv oil and butter in a large pan, add a tablespoon of bread crumns (you can also use flour), let it toast slightly and then add the filling, seasoning it with salt, pepper and a generous amount of cinnamon and nutmeg. Stir and let it cook for about 5 minutes, to absorb the excess moisture, then let it cool down. You can also prepare the filling one day in advance and keep it in the refrigerator. Prepare the egg pasta as usual, cut out circles of about two, or two and a half inches diameter, put a small amount of filling in the middle, brush the edges with egg yolk (slightly beaten in a cup) so that they will adhere better, close to form a half-moon and then seal pressing the edges with a fork. 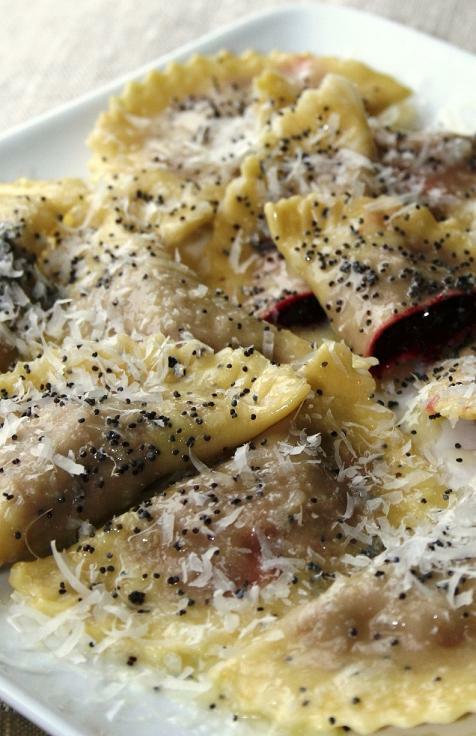 Cook the casunziei in boiling water for few minutes, dress with grated parmigiano cheese, brown butter and poppy seeds. Hi. Love the Dolomites and we've made casunziei a couple of times since coming back from a trip there in '09. I'd love to be able to do the version with beets and smoked ricotta, though. We live in Berkeley and I have never been able to find a source for smoked ricotta anywhere in the East Bay or SF (the Cheese Board in Berkeley has recently started carrying a dry, smoked sheep's milk cheese from Austria that comes close). Do you know where I could find it? Hi, so glad you like the casunziei and had the chance to try them in the dolomites! Unfortunately I have never seen smoked ricotta here, I know the ricotta salata is pretty popular, but it's quite different. Have you tried to check Rainbow Grocery, or else Ferrari Food? There is also a gourmet supermarket in Glen Park, called Canyon Market, they carry a lot of different cheeses, they might have it. Star sightings: Which celebrities were spotted at Disney?Photos of celebrities who have made appearances at Walt Disney World Resort through the years. Pictures: Where to charge phones at Orlando theme parksFinding yourself in a theme park with a low battery can be frustrating. Here where to charge up at Disney World, SeaWorld Orlando and Universal Orlando..
Ironically, given Kendrick Michael Kors Purses Clearance Lamar's tacit sponsorship, the alternative an album like The Epic Bolsos Michael Kors Baratos would Oakley Sunglasses Sale UK need to propose would be to the nastiness Longchamp Soldes Destockage of much present day hip hop, including Lamar's Ray Ban Sunglasses Sale UK To Pimp a Butterfly. It seems only appropriate, somehow, that Washington's debut album should be the leading jazz story of a year Sac Longchamp Solde partly defined by Black Lives Matter. Say this is merely coincidence, and you'll get no argument from me.